During each School Holiday throughout the year ‘Life. Be in it.’ Sport for All offers a variety of activities for Primary School aged children. 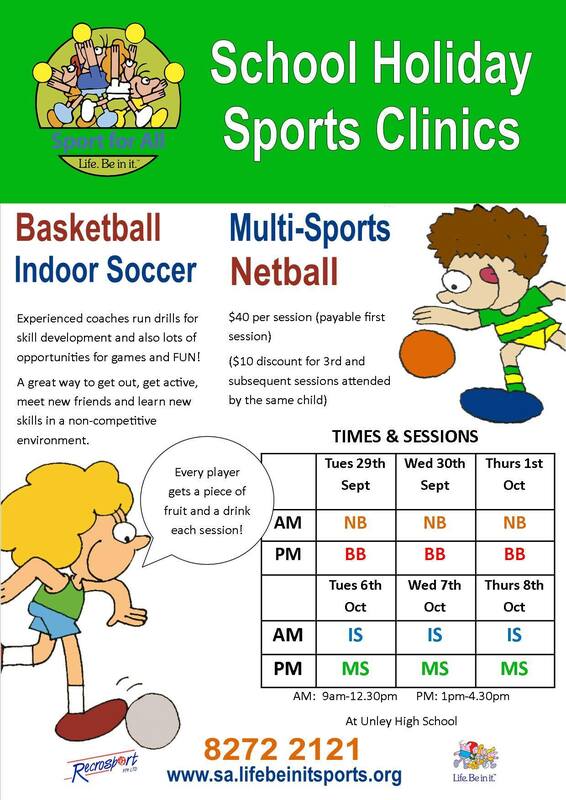 Our Unley venue runs half-day coaching clinics in Basketball, Indoor Soccer, Netball and Sports Combo. Each session is designed to teach children the basic skills and rules of the game in skills-based activities and full-court games, whilst having lots of fun! Participants receive quality coaching, a personalised certificate and a daily fruit snack. Prices are just $80 per full-day session and multiple-session booking discounts are available. Registrations are now OPEN! Please call us on 8272 2121 to book your child in! MARS Sporting Complex offers vacation care programs that expose children to a number of different activities with an emphasis on creating a distinct connection between fun and sport. Children will participate in basketball, badminton, volleyball, indoor soccer, games/relays in a jam-packed four-hour schedule. The MARS Vac Care Sports is very cost effective... incredible value... for life! Please click here for more information. Enrol your OSHC Vacation Care program today by calling 8363 2966. Minimum booking 50 children, however adjustments can be made for smaller groups.